For thousands of years, edible fungi have contributed to the variety of home cooking. Here are a few of the most popular edible mushroom varieties, from the common to wild. Unless you are an experienced mycologist, do not eat mushrooms you find growing wild. Many poisonous species look very similar to more savory ones. Agaricus (white mushroom, button mushroom): Widely available, varies in color from white to light brown and in size from small to jumbo stuffer. Plump and dome-shaped, with a pleasing flavor that intensifies when cooked. Mature Agaricus with open veils have an intensely rich taste. 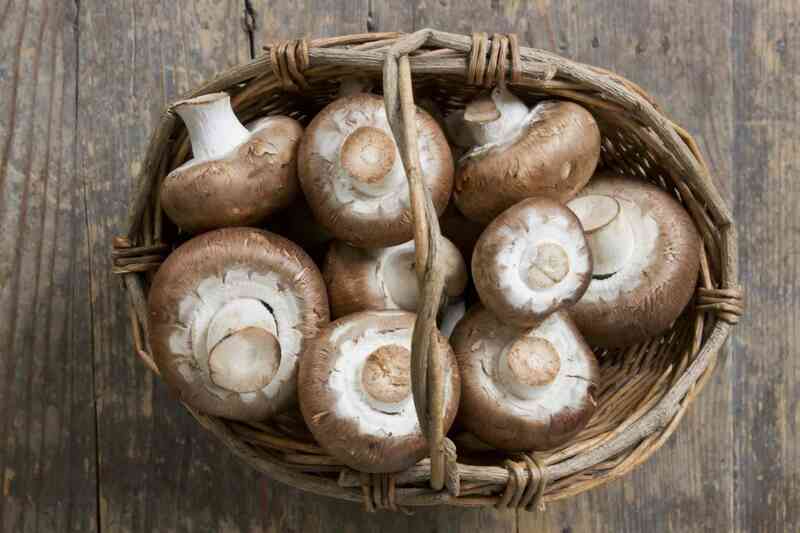 Agaricus is quite versatile, being excellent for use both raw and cooked. Also available canned and dried. Chanterelle (girolle): ​Intrinsic to French cuisine, this vase-shaped, bright yellow to orange fungus is expensive when fresh. Nutty and delicate in flavor and texture, they are also available dried and canned. Add late in the cooking process to avoid toughening. Use in salads, sauces, and risottos. Crimini (Italian brown): Naturally dark cap that ranges in color from light tan to rich brown; rich, earthy flavor is more intense than that of the Agaricus. Substitute for button mushrooms to add a more full-bodied flavor. Shiitake (oak mushroom, Chinese black mushroom, forest mushroom, golden oak): Ranging in color from tan to dark brown, and characterized by broad, umbrella-shaped caps up to ten inches in diameter, with wide open veils and tan gills. The shitake has a rich, full-bodied flavor, almost steak-like, with a meaty texture when cooked. These are best when cooked by almost any method, particularly sautéing, broiling and baking. Remove stems before cooking but reserve them for soup stocks. Oyster: The fluted cap resembles a fan and ranges in color from a soft beige-brown to gray. It can be eaten raw in salads but more often this mushroom is cooked to bring out its delicate flavor and velvety texture. Some say this mushroom has a faint oyster-like or seafood flavor that matches its physical likeness to oysters. Enoki (enokitake, snow puff, golden, velvet stem): With long stems and tiny, snow-white caps, these mushrooms are joined at the base and resemble bean sprouts. The flavor is light and mild, almost fruity, with a crisp texture. They are also available canned. Before using, cut away from the communal base. Use in sandwiches, salads and as garnishes. If you use them in a cooked dish, add at the last possible moment as heat toughens enoki. Portabello or Portabella: Largest of the commercially available mushrooms, it's the mature version of the crimini. Its popularity derives from a brilliant marketing campaign in the 1980s to sell what was then perceived as "over-mature" common mushrooms. The long growing cycle gives it a deep, meat-like flavor and substantial texture. They are delicious whole—sliced, grilled, baked, stir-fried, or deep-fried. Be sure to trim off the dry, fibrous portion of the stem. Porcini (cepes, boletes, boletus, steinpilze. Singular is porcino): A favorite in Tuscan recipes, porcini mushrooms resemble the toadstool in a fairytale. Weighing from a couple of ounces to a pound each, with caps from 1-10 inches in diameter, porcini have a smooth, meaty texture with a pungent flavor. They are pale brown in color. With many general cooking uses, they are available in many grades and can be expensive. Also available dried. Morel (black morel): A relative of the highly-prized truffle this tan to dark-brown, cone-shaped, spongy fungus has a smoky, earthy, nutty flavor. The darker the mushroom, the more pronounced is the flavor. This mushroom must be cleaned well when fresh due to its dimpled head. Like the truffle, it’s expensive, but also available canned and dried.